The new Caregiver Program, effective November 30, 2014, was touted as a better and more efficient program for Caregivers and for Canadian employers. But since the launch of the Caregiver Program, only one in ten applications have been approved. Lower-skilled Caregivers applications accounted for the most of these rejections. The Caregiver Program allows a Canadian or permanent resident to employ a migrant worker to take care of children and other family members who need care. An employer needs to apply and receive a positive or approved labour market impact assessment (LMIA) from the government before they can hire migrant workers under the Caregiver Program. 1. Caregivers for children under 18 years of age. Within this stream, there are higher-skilled and lower-skilled positions. High-skilled positions include the National Occupational Classification (NOC) code 3152 – Registered Nurse and (NOC) code 3233 – Licensed Practical Nurses. Lower-skilled positions include the National Occupational Classification (NOC) code 3413 – Nurse Aides, Orderlies and Patient Service Associates and (NOC) code 6471 – Visiting Homemakers, Housekeepers and Related Occupations). Between December 1, 2014 and March 31, 2015, 90% of all applications from both the Caregivers for children under 18 years, and the Caregivers for high medical needs have been rejected. 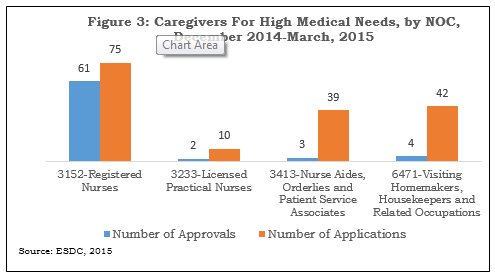 During this period, for the whole Caregiver Program, there were 917 applications and 92 approvals. 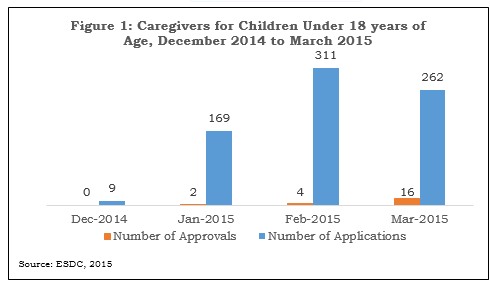 The largest share of rejections (97%) of applications were under the Caregivers for children under 18 years of age category. Between December 1, 2014 and March 31, 2015, there were 751 applications and 22 approvals. The breakdown of LMIA applications to approvals is shown in Figure 1. The low approval rate may be in part due to additional Ministerial Instructions spelling out criteria for refusal to process LMIAs from employers, received on or after December 1, 2014, who applied to hire Caregivers with the live-in requirement without demonstrating necessity for live-in care such as for high medical needs client or exceptional circumstances. Nonetheless, the rejection rate of applications for this category is extraordinarily high. 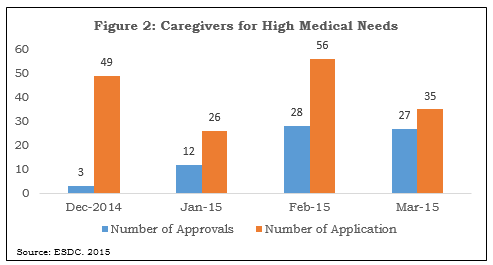 Under the Caregivers for people with high medical needs, 42% of applications were rejected between December 1, 2014 and March 31, 2015. During this period, 166 labour market impact assessments (LMIAs) were submitted and 70 were approved. The breakdown of LMIA applications to approvals (LMIAs issued) is shown in Figure 2. There was more demand for Registered Nurses than Licensed Practical Nurses among the higher-skilled occupational groups. In fact, Registered Nurses were in highest demand and received the greatest number of approvals (LMIA’s issued) among all the occupational groups within this Caregiver Program category, as shown in Figure 3. Caregivers from the higher-skilled occupations accounted for 68% of approvals compared to 32% from the lower-skilled occupations for the whole Caregiver Program. Caregivers from the higher-skilled occupations accounted for 9% of all applications compared to 91% of applications for the whole Caregiver Program as shown in Table 1. Lower-skilled Caregivers have received very high rejection rates despite making up for the lion’s share of applications for the period between December 2014 and March 2015 under the new Caregiver Program. As mentioned earlier, the previous Live-in Caregiver Program (LCP) did not have higher-skill occupational streams. As a comparison, between January and March, there were 4,355 LMIA approvals for LCP applications in 2013 compared to 92 approvals in 2015 for all lower-skill occupational streams in the new Caregiver Program.